Our monthly lunch club decided to dig not-so-deeply into LA’s culinary history for one of those “landmarks,” as we chose The Ivy on Robertson Boulevard for our May dining destination. The Ivy opened in 1983, a year many L.A. residents consider to have occurred sometime during the Paleolithic Age. We already knew The Ivy is a star-gazing Mecca where all the people are beautiful, where the music is loud, where everyone reads their phones while they eat, and where customers routinely deplete their savings accounts after the check arrives. So, let’s go retro as we pop in Randy Newman’s “I Love L.A.” on the tape deck of the LeBaron convertible, crank up the volume, and head east on I-10 searching for Big Meals and Big Deals. Who knows? Maybe we’ll get lucky and find a new agent there. 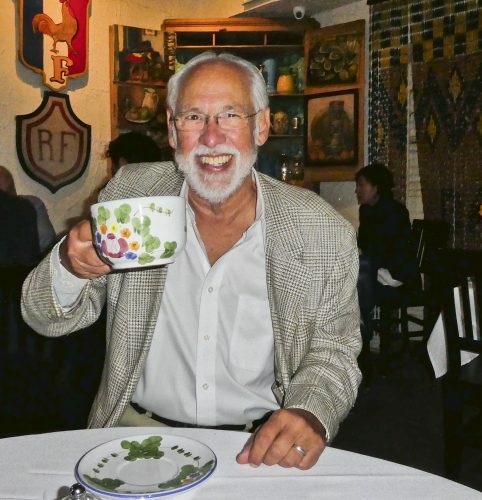 Our special guest was longtime Palisadian Peter Kreitler, an ordained Episcopal minister and tireless environmental activist, who at first blush, seemed like an improbable choice to be taken to a place which could easily be perceived as nothing more than a Westside “shrine” to excess. And, that point also begs the larger question as to just how he ultimately found his way to “La-La Land” in the first place? Peter was born, raised, and educated in New England, but has spent his adult life in Southern California, with the exception of the five years he lived in the Midwest. He and his wife Katy have three grown children and three grandchildren, all of whom live in California. Peter served as minister of St. Matthew’s Episcopal Church from 1974 until 1990. During those years he became deeply involved in the environmental movement and formed a non-profit educational organization called Earth Service Inc. He even produced and hosted “Earth Talk Today,” a television show about environmental issues that ran for 12 years. He is currently working on his sixth book, which is a reflection and study of patriotism in America, based on his research from his extensive magazine collection of more than 4,000 issues about the American flag—a collection that spans from 1839 to the present. 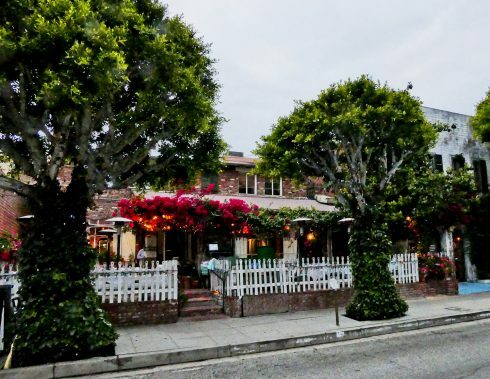 When we pulled along curbside at The Ivy, we could already hear the blasting sound of Janis Joplin from the jam-packed patio area. The maitre d’ accommodated our request for a quieter room inside the restaurant, and we were pleasantly surprised at the sudden serenity we found there that was in such stark contrast to the Coachella Music Festival atmosphere on the patio. The Ivy’s warm interior surroundings presented an unexpected comfortable and old-fashioned homey atmosphere—not exactly features we were expecting to find in this trendy destination for L.A.’s fast-trackers. As a native New Englander, Peter was immediately impressed with the menu that featured a wide variety of seafood. He asked, “Have we just landed in Boston?” The rest of us agreed with him about the remarkable array of choices available, but I reminded my tablemates to keep their eyes trained on the left side of the menu and avoid the right hand column (with the price list) which could adversely affect our appetites. Peter and I both spotted the soft-shell crab on the “daily specials” menu and wasted no time with our decision. Barry shot me a dubious look after we placed our order. Barry has always considered crab as seafood’s tasteless equivalent of “tofu,”—nothing more than a “place-holder” for real seafood. We ordered the French-fried wild calamari as an appetizer, which has become standard issue for us recently. This time Arnie was the one who gave us a skeptical stare, and then proceeded to eat the entire loaf of hot-baked bread. He holds the same attitude about calamari that Barry has about crab. Barry ordered the Cobb salad and Arnie opted for the spinach ravioli with pink sauce. We finished off our lunch with a slice of Key lime pie. Our poker-faced waiter Walter slowly warmed up to our corny comments during the meal, and as we left the restaurant, he followed us to the valet stand and thanked us for coming. He either liked our well-worn jokes, or perhaps it was our generous tip. We preferred to think it was our charming personalities. Bob Vickrey is a writer whose columns appear in several newspapers including the Houston Chronicle and the Waco Tribune-Herald. He lives in Pacific Palisades, California.